A huge X1.2-class solar flare erupted from the sun late Tuesday (May 14, 2013), the fourth major flare in two days from a busy sunspot on the surface of the sun. 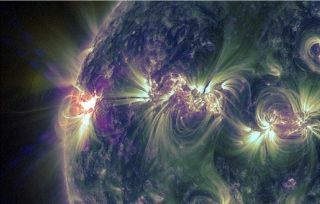 NASA's Solar Dynamic Observatory captured this view of the event. Severe space weather could be as devastating to the planet as serious tornadoes and other natural disasters, NASA chief Charles Bolden said in a public address Tuesday (June 4). Bolden spoke before scientists and industry members at the Space Weather Enterprise Forum, which was held at the National Oceanic and Atmospheric Administration Auditorium and Science Center in Silver Spring, Md. The daylong conference aimed to bring together researchers and policymakers to identify how the sun's activity impacts Earth, and the potentially harmful effects of space weather. "This conference shines a spotlight on another naturally occurring phenomenon that can be just as punishing as a tornado — space weather," Bolden said in his written remarks for the event, after mentioning his grief at the lives lost during the deadly outbreak of tornadoes in the Midwest in recent weeks. Developing a clearer picture of when these storms may strike, and their potential impacts, is crucial, Bolden said. "Given the growing importance of space to our nation's economic well being and security, it is of increasing importance that NASA and its partner agencies continue to advance our nation's capability to understand and predict space weather events," he explained. The radiation released by severe sun storms can also be risky for astronauts living aboard the International Space Station. Understanding the way humans in space are affected by space weather will help NASA plan future manned missions to the moon, Mars or beyond, Bolden said. Last week, a new study found that astronauts on a mission to Mars could be exposed to dangerous levels of radiation from both solar particles and cosmic rays from outside the solar system, even with shielding on the spacecraft. The research, which was published in the journal Science, determined that on a trip to Mars, spaceflyers would be subject to radiation doses between 100 and 1,000 times higher than on Earth. "The findings will aid design of future human missions by reducing uncertainty about how much shielding from radiation astronauts need," Bolden said. "For these and other reasons this forum and our efforts to study, monitor, and mitigate radiation exposure are so very important." The NASA administrator also spoke about the need for international cooperation in studying the effects of space weather. "Space weather is a problem that crosses all borders and demands input from our international counterparts," Bolden said. Next week, Bolden is scheduled to speak at the 56th session of the United Nations Committee on the Peaceful Uses of Outer Space in Vienna, Austria. This year, for the first time, the UN committee has added space weather as a topic for discussion, recognizing it to be as serious a threat as space junk and near-Earth asteroids, Bolden said. "With the United Nations now on our team, we are assured of even greater global coordination in the effort to increase our understanding of space weather and its impact on Earth and throughout the solar system," he added. "We have shown how, working as a team, we can save lives when hurricanes and tornadoes strike here on Earth. I am confident we can be just as effective working together to protect our people, our critical infrastructures, and our planet from the dangers of space weather."